End mills are used to mill large paths in the FR4 board material. 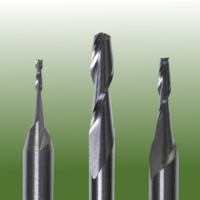 The width of the cutting edge of an end mill is the size of the end mill.FR4 is highly abrasive and requires the use of specialist end mills, PCB Supplies supply the highest of quality End Mills made of high grade Tungsten Carbide which feature very high cutting performances whilst maintaining the tightest production tolerances. All of our bits can be purchased with or without rings. When ordering drills with depth rings, you may specify the depth ring position tosuit your requirements.